Here’s a wonderful chance for young pianists and string players to attend a Summer course in Vermont (US) with an illustrious faculty and exciting performance opportunities. The Manchester Music Festival (MMF) Young Artists Program is a full scholarship, six-week intensive chamber music festival for string players and pianists, aged from 18 – 26. Occurring annually every summer in scenic Manchester (Vermont), the 2017 Young Artists Program will take place from July 3rd to August 13th, 2017. Young Artists will receive daily coaching sessions by a faculty composed of world-renowned artists and pedagogues. The primary focus of the Young Artists Program is to intensively study and perform chamber music at a high level, and to benefit from outstanding musical guidance on a daily basis. 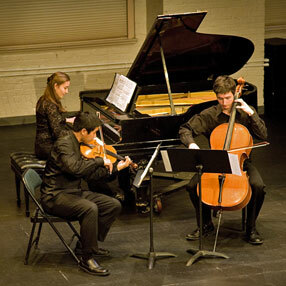 During the course, students can expect to study several chamber masterworks, with ensemble sizes ranging from duos to octets in a broad spectrum of repertoire spanning the centuries, from Baroque to Contemporary. Groups will also be selected to perform in the weekly MMF Young Artists concert series. On August 3rd, 2017, Young Artists will participate in one orchestral concert, performing Beethoven’s “Eroica” Symphony and the Brahms Piano Concerto No. 2 in B-flat Major, with Ignat Solzhenitsyn conducting and pianist Alexander Kobrin. Young Artists will also have the opportunity to perform in public masterclasses and take private lessons with many of the faculty members. In addition, they will benefit from forum discussions addressing principles of entrepreneurship and career development which will assist in forging successful paths as professional musicians. ‘This is a full-scholarship program, meaning that we offer this opportunity to outstanding students at no cost to them, other than the application fee. This makes us quite unique in the world of expensive summer programs’ – Adam Neiman (artistic director of the MMF, concert pianist and professor of piano at the Chicago College of Performing Arts (Roosevelt University)). Each MMF Young Artist receives a scholarship providing full tuition, free accommodations, and a modest weekly stipend. Students are responsible for their own meals. Scholarships are made possible by the generous contributions of individual sponsors and endowments, and all of the Young Artists will have opportunities to interact socially with their patrons during their stay in Manchester. The closing date for applications is February 15th 2017. My son is 11 years old and my daughter is 9 years old, they won’t benefit from this chance right now, hope you carry on giving opportunities like that to young artists. Both my children are learning Piano& going through international certificates with grades .